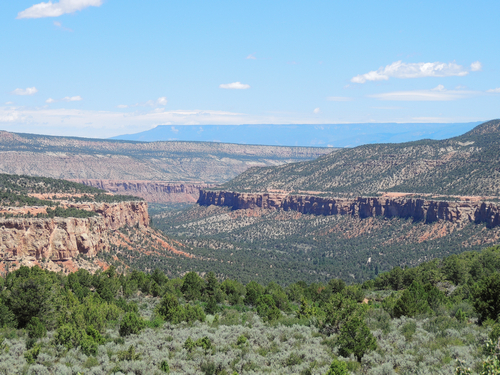 Escalante Canyon is a very nice run from desert at the Gunnison River to forest on the Uncompahgre Plateau. 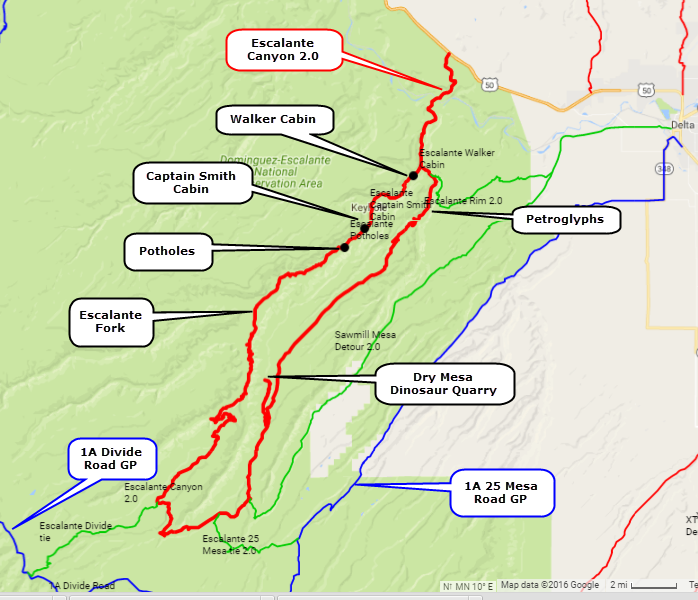 This Jeep trail takes you upstream through Escalante Canyon (west side of loop), climbs up onto Love Mesa, crosses over to Dry Mesa then drops back down into Escalante Canyon. 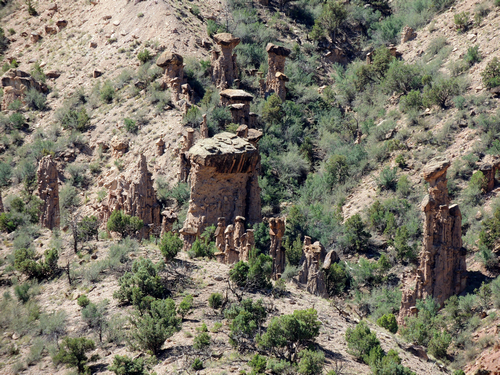 Keep a sharp eye out and you will see several areas with interesting hoodoos. 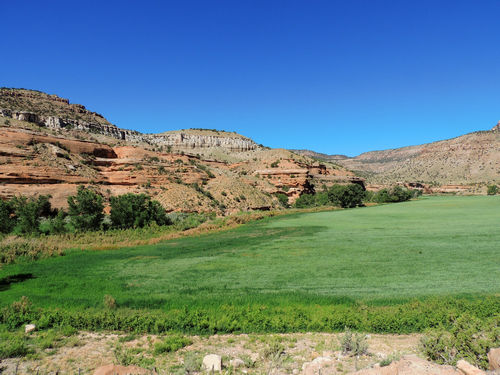 The lower part of the canyon is desert, but farmers use the water to irrigate cropland. 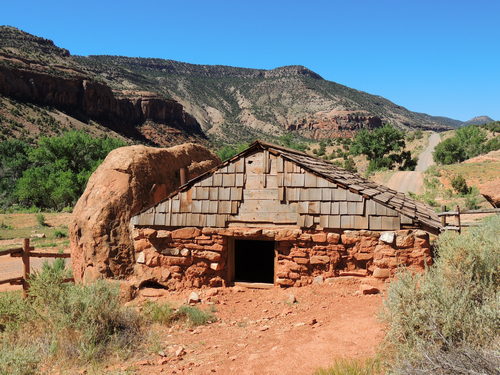 The Walker Cabin was built in 1911 by Harry Walker, a skilled bricklayer, and his 4 sons. Short of funds, he laid up the walls with dirt mortar. When times got better, he covered the walls with cement. 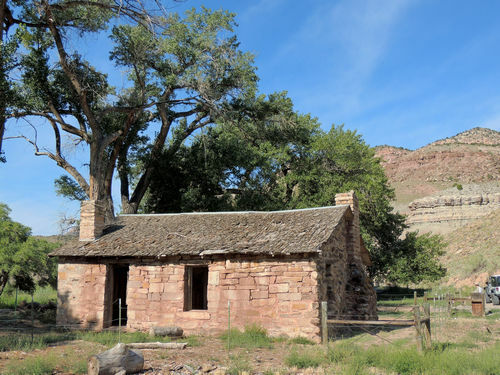 The Captain Smith Cabin was built in 1911 by a Civil War veteran and expert limestone carver by laying up 3 walls against an upright stone slab. He hollowed out the rock slab for a bed. Not far above Captain Smith's Cabin are the Potholes. This is from a 1993 article in the Sun Sentinel. Located on Bureau of Land Management property about 12 miles south of U.S. 50, between Delta and Grand Junction, the Potholes were created by the union of Escalante Creek and a formation of dark gray igneous rock that stands in contrast to the smooth, red sandstone walls of Escalante Canyon. 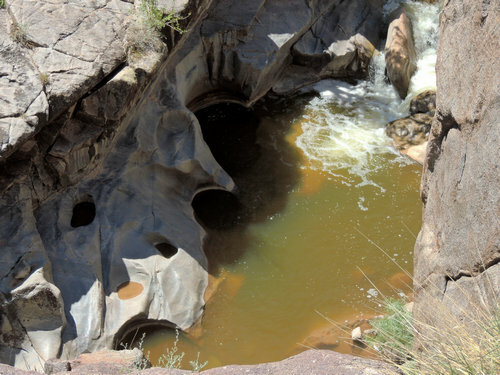 The soft sandstone gave way to the creek more easily than the harder igneous rock, which forced the stream to sculpt a series of natural bowls. Even when the stream is running low -- and that`s most of the time -- one bowl must fill before the water can continue on. The result is a chain of pools and small waterfalls, bordered by smooth rocks perfect for sunbathing. Set amid pinon-juniper and rock lizard country, the Potholes are a jumping-off point in more ways than one. Perhaps 100 yards downstream from where a trail meets Escalante Creek, surrounded by rock ledges, is the ``jumping hole.`` The most popular jumping ledge is 15 to 17 feet above the water, although visitors have been known to jump from ledges 10 feet higher. For the less adventurous, there`s a rounded rock offering a 4-foot plunge. The water hole is about 15 feet deep. A warning note: About 50 yards downstream from the jumping hole is the ``death hole.`` This is a spot, clearly marked with a warning sign, where the water cascades about 20 feet into a deep pool of unknown depth. Over the years, there have been several drownings in the death hole. While the water is deep enough to permit a dive, the force of the waterfall kept the divers from swimming back to the surface. We did not go down to the water, only viewed from above. There is a fairly easy route down from the southern parking area. Head south and drop down into a side wash, then to the main creek. 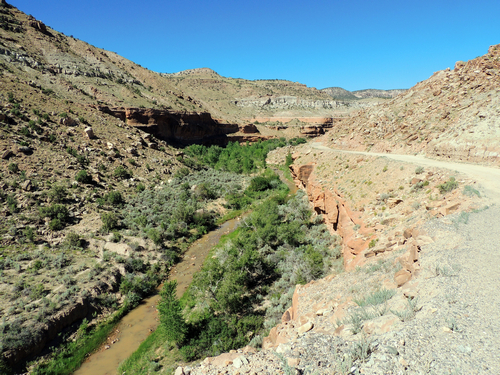 As you proceed up the canyon you will come to a ranch at Escalante Fork, where the north fork of Escalante Creek joins the main thread. This ranch has a center pivot irrigation system. 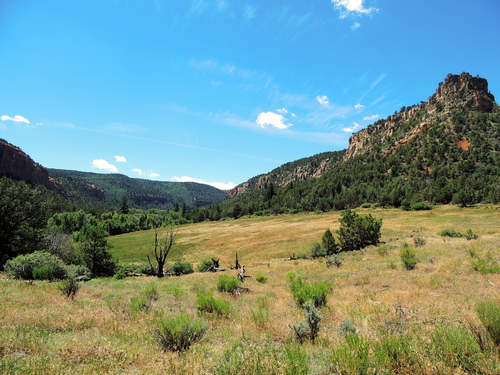 The canyon becomes more forested with an occasional opening where cattle graze. 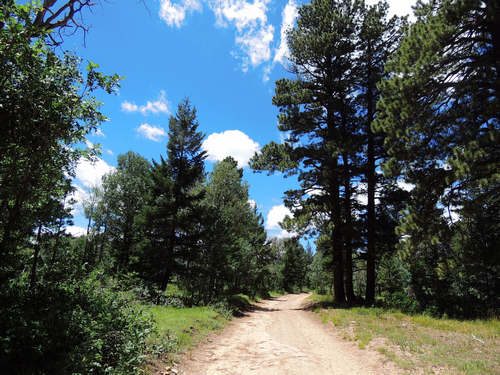 The road climbs up onto Love Mesa where there are great views back down where you just came from. After that it is in the trees as you circle and head back down Dry Mesa. Escalante Divide Tie to the Divide Road. Escalante 25 Mesa Tie to 25 Mesa Road. Sawmill Mesa Detour to Delta. 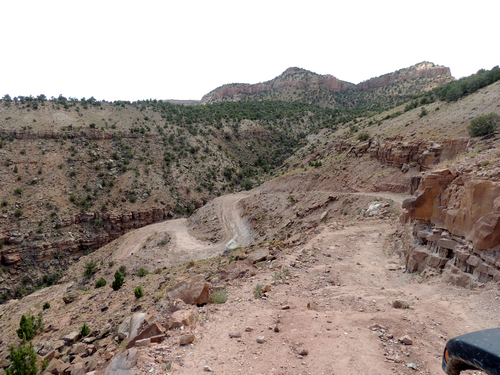 This track has a spur road leading to a quarter mile hiking trail to the Dry Mesa Dinosaur Quarry. The quarry was closed in 2000, and is no longer of much interest, except to say you have been there. Near the end of the trip you will come to a sign for petroglyphs. There may have been some here in the past, but it is all graffiti now. 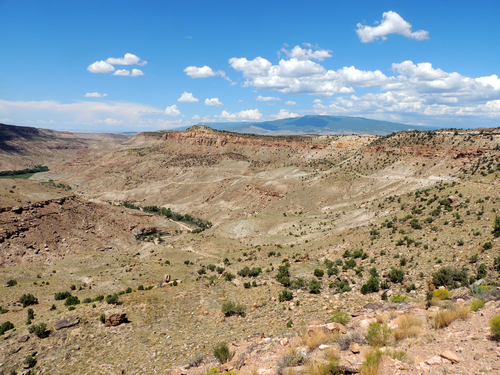 The descent from Dry Mesa to Escalante Canyon is interesting. 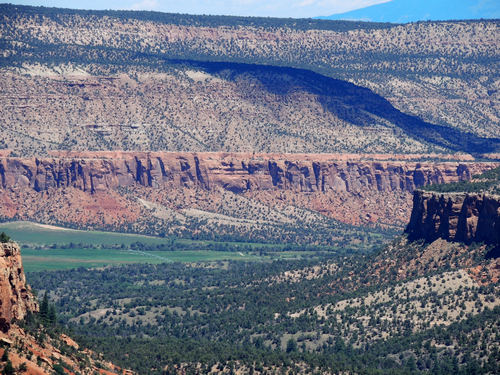 You can choose to climb up the Escalante Rim Road to Delta to finish the trip.